Kittens Gone Lentil: VeganMoFo 2016 #19: Goth Night! 19th: Goth Day – Blues, purples, blacks? Let your dark side shine. This was a fun one! I definitely knew I wanted to do something purple and black, so I reached for my trusty Color Me Vegan and flipped to the blue/purple chapter. There I saw a recipe for German Red Cabbage (Rotkohl). I remembered making a similar recipe from another book last year, which turned out a gorgeous purple colour. So that decided it for me! 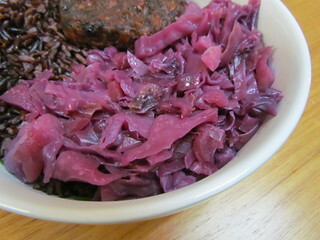 Red cabbage, apple and red onion is simmered for about an hour with ginger, water, ACV, brown sugar and spices. I didn't bother putting the spices in a spice bag, because I didn't have one, I just put them in and fished them out at the end (though the peppercorns went all soft and yummy). Except I didn't have any whole allspice, so I just added a little ground. I didn't finely shred the cabbage, because this seemed like a fast way to cabbage mush. Instead I thinly sliced it, which gave it the texture I was after. The recipe calls for quite a lot of apple cider vinegar, and I did dilute that with a bit of water as well. There is the option of serving this as a 'warm winter slaw', or of adding a cornstarch slurry and simmering to thicken up. I took the latter option, and I really enjoyed it. I made a half batch of this recipe, which ended up being three servings. Of course, one purple cabbage dish does not a goth night make. 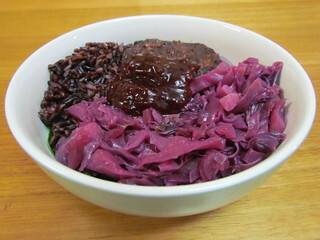 I served this with some black rice, purchased beetroot and black bean burgers, and some jarred beetroot relish. All sorts of purple and black! All up I was pretty pleased with this dinner. And I was glad that I had a rainbow week concept work out! Hurrah! What is your flavour purple food? 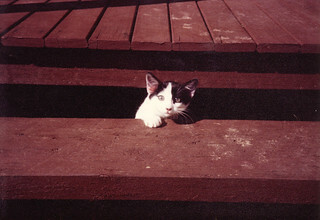 Another cute kitten photo of my third childhood cat, Patches! His face is so little here! He grew into a giant. But he was the gentlest giant that ever was! I was pretty happy with how it turned out. I love how purple this turned out! And that is a hard color to cook for. And heck, it even sounds like it would taste great all together as well!